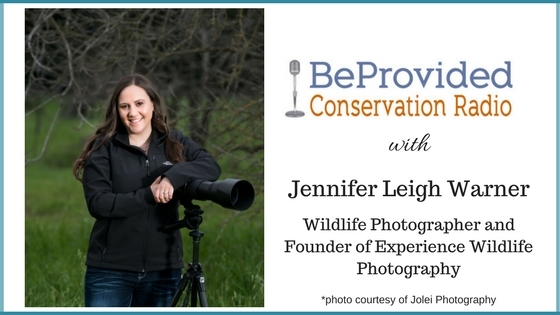 Jennifer is a Fine Art Conservation Wildlife Photographer and founder of Experience Wildlife Photography living in California. She specializes in creating meaningful images that convey a message of hope for the natural world. Jennifer feels strongly that by sharing these images of beautiful animals in their environment, she can inspire others to protect their own environment. She is also a member of the North America Nature Photographers Association ethics committee in which she promotes the ethical practice of photographing wildlife. Jennifer and I both volunteer for the Cheetah Conservation Fund Nor Cal Chapter. If you don’t know, CCF is a non-profit dedicated to the conservation of cheetahs founded by Dr. Laurie Marker in Namibia. We have an interview with Dr. Marker and several others from CCF already on iTunes. But Jennifer and I were talking during our last meeting about the importance of sharing stories of hope and how powerful her wildlife images are for doing this. So I am happy she agreed to be on the show today so we can talk about her work and hear her story.